Travels with a Tin Donkey: Book Review: Kittel's Vittles Revealed in Tour de Cuisine! 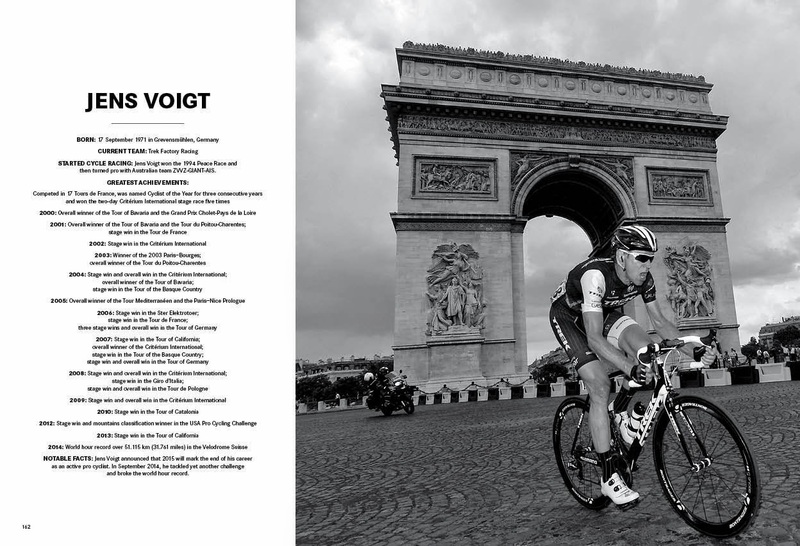 Book Review: Kittel's Vittles Revealed in Tour de Cuisine! It is said that Tour de France cyclists consume quantities of food during the event second only to sumo wrestlers in training: 11,000 calories per day for the former, 14,000 for the latter. 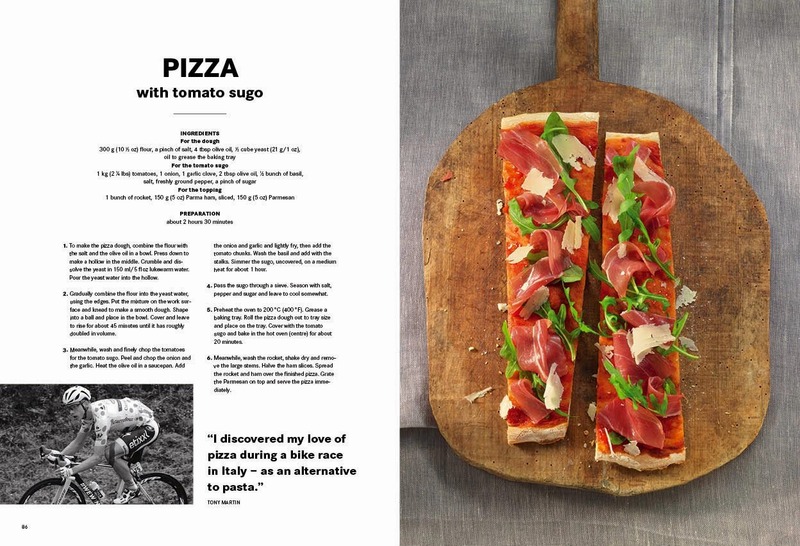 But while sumos are famous for their vats of greasy soup, an innovative new book suggests that pro cyclists are in reality a pretty sophisticated bunch when it comes to noshing. 2015 marks the appearance of a new German UCI Pro Continental team, BORA-Argon 18. With new name sponsors it is actually the successor to the NetApp-Endura squad and like its predecessor has received a wild card invitation to the Tour de France, hoping in 2015 to match the results of last year when the team showed it deserved to be included amongst the elite of the sport. Sponsor BORA's link to cyclesport could be found on broadcaster Eurosport's German television coverage of major European races through its regular advertisements. The company, based near Munich, is a manufacturer of high-end cooktops and extractors. Without a range hood, cooking odors are drawn out directly from the cooking surface. From one employee in 2006, the firm has grown to more than 50 today with subsidiaries in Austria and Australia and won various design awards along the way. It is a typical example of a German “Mittelstand” company, producing an innovative, high-quality (and cost!) product with a great deal of personal attention. It appears that founder Willi Bruckbauer's personal enthusiasm for cycling has expanded to encompass this pro team, whose other title sponsor is Canada's Argon 18, provider of the team's bicycles. With German pro cycling coming back to life thanks to the performances of the likes of John Degenkolb, Tony Martin and Marcel Kittel and the return of the Tour de France to German public television after an absence of some years due to the fall-out from doping scandals, it is perhaps not a surprise that a German company would seek to maximize its exposure by sponsoring a team. 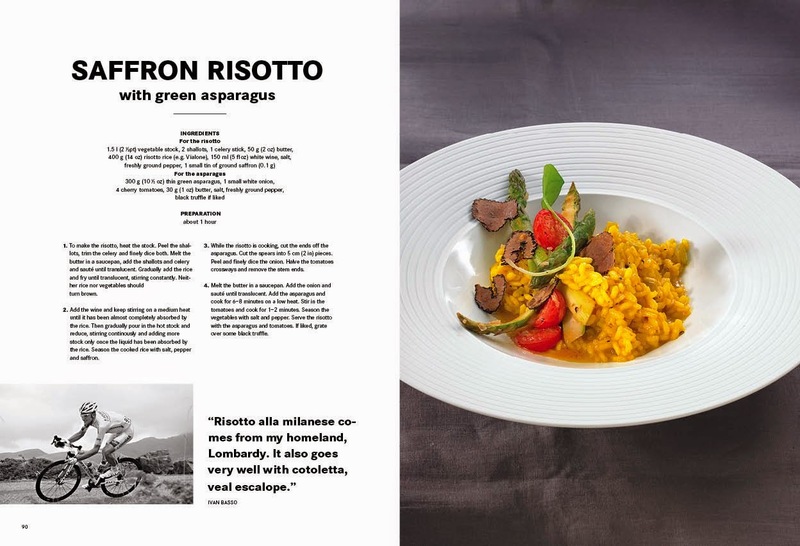 What is unusual is how the sponsor aims to link the sport of pro cycling to its product by producing a very high-quality cookbook featuring favorite recipes of racers. 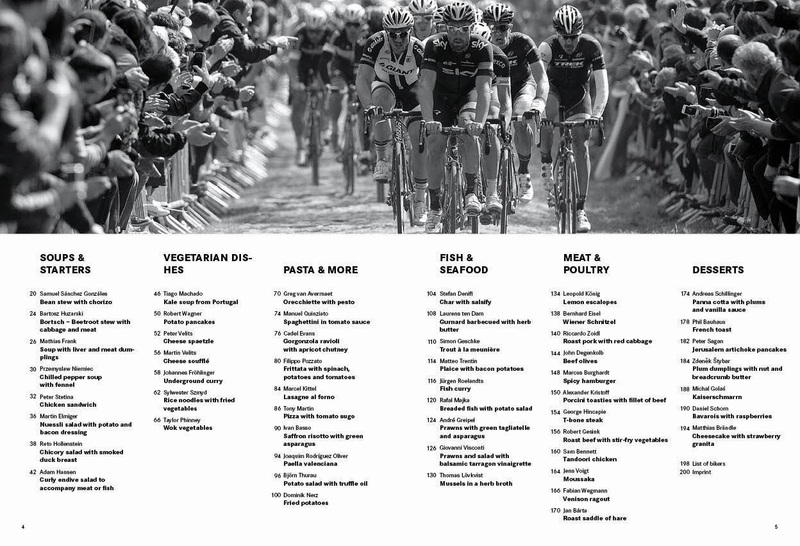 The result is the very attractive “Tour de Cuisine,” available in several language and featuring 53 cyclists and their comfort foods. It is probably unlikely that many of these riders are whizzes in the kitchen, given a BORA cooktop/teppan grill or not, but the book includes their comments about the various dishes, accompanied by excellent photos of the riders and a brief summary of their palmares. 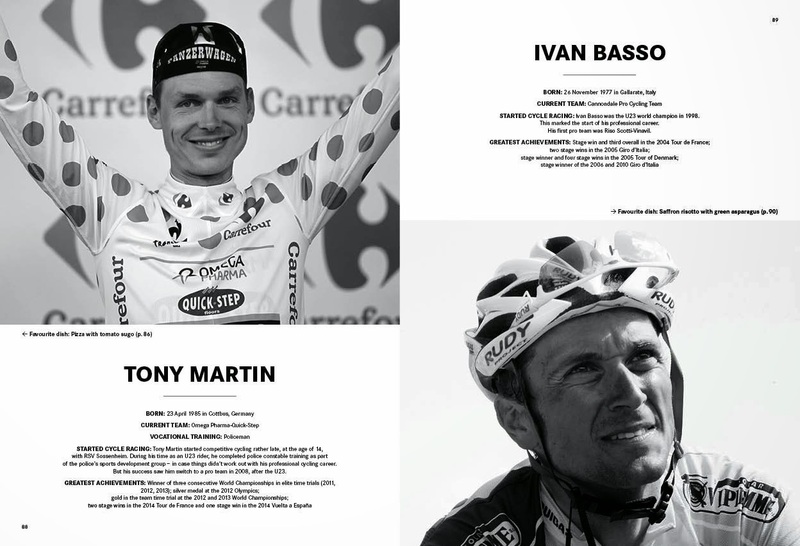 The contributors are not limited to Team BORA-Argon 18 but include many of the big names of the pro peloton, including the aforementioned German trio. It cannot be overlooked that some of these summaries are a bit peculiar in their sharing of information. For example, George Hincapie is described as having ridden in 17 Tours de France, completing 16 and “he acted as a helper for the likes of Alberto Contador and Cadel Evans.” For someone else as well, methinks. Aside from this bit of historical revision, the book is more entertaining than the usual cookbook. Many of the recipes reflect a certain nationalism: Americans Peter Stetina with his Chicken Sandwich and Mr. Hincapie's T-Bone Steak. 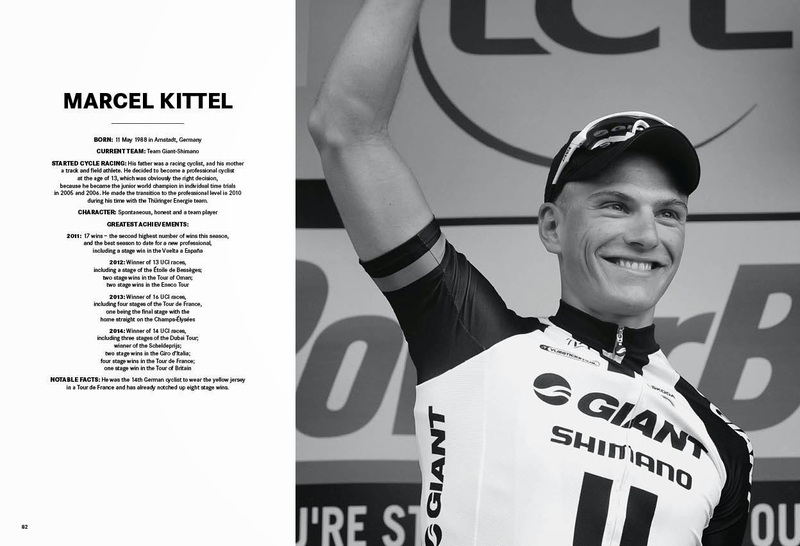 For those unfamiliar with Mitteleuropa cuisine, Michal Golaś'senthusiasm for Kaiserschmarrn or John Degenkolb's for Beef Olives (better known as Rouladen) should be no surprise. But it is notable that many riders eschew their native victuals in favour of foreign (often Italian or Asian) meals. 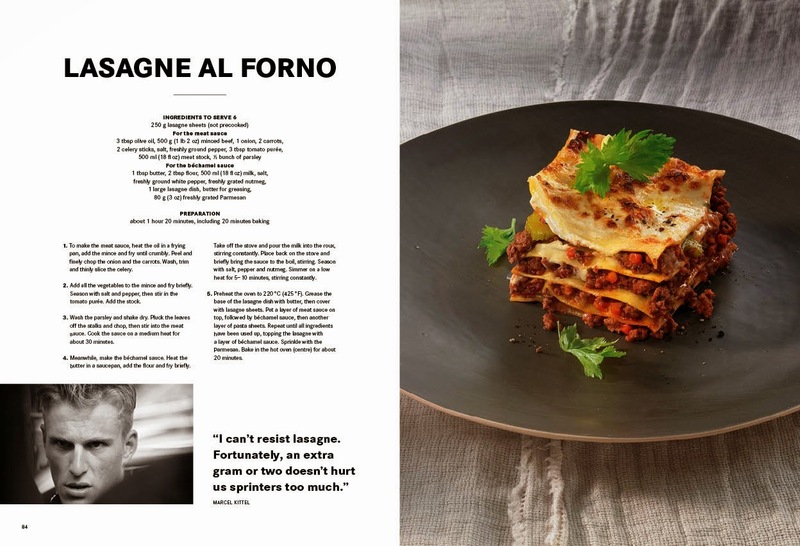 Pole Sylwester Szmyd goes for Rice Noodles with Fried Vegetables, Jens Voigt for Moussaka, André Greipel is keen on Prawns with Green Tagliatelle and Asparagus and Golden Boy Marcel Kittel keeps up his sprinting strength with Lasagne al Forno apparently. 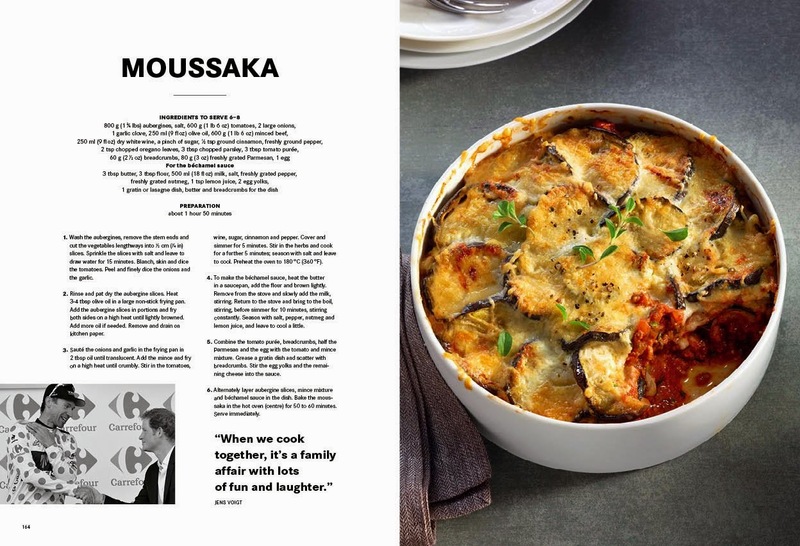 As is traditional, the cookbook is divided into chapters including Soups & Starters, Vegetarian Dishes, Pasta & More, Fish & Seafood, Meat & Poultry and Desserts. Cyclists representing Poland, Switzerland, Germany, the USA, Spain, Italy, the Czech Republic, the Netherlands, Austria, Sweden, Portugal, Slovakia, Australia, Norway and Belgium reflect the United Nations (or at least mainly European Union) make-up of the pro peloton. Truly a bunch of Feinschmeckers! 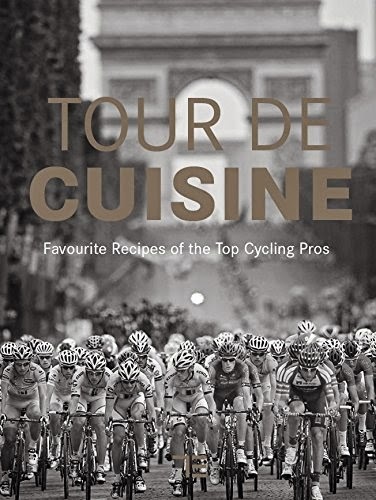 A fine book that would be at home either on your cookbook shelf or in your cycling library, “Tour de Cuisine” is an excellent effort to unite gourmet cooking and road racing, two of the great pleasures in life. And in your heart you know that when Matthias Brändle (Swiss) broke the One Hour Record on October 30, he rode those 51.850 kms powered by Cheesecake with Strawberry Granita (page 194, 1 hour preparation time coincidentally). It is available as of now at Amazon.de in German (ISBN: 978-3-8338-4538-3), English (ISBN: 978-3-8338-4642-7), French (ISBN: 978-3-8338-4643-4), Italian (ISBN: 978-3-8338-4644-1), Spanish (ISBN: 978-3-8338-4646-5) and Dutch (ISBN: 978-3-8338-4645-8). It will also be available at fancy cooking equipment stores.